Learn from an innovation executive, Rhodes scholar and athlete. Worksheets to manage your catapult!
" 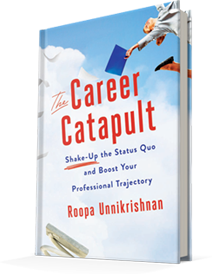 I was so impressed with The Career Catapult, that I couldn't put it down easily -- It's intriguing, insightful, useful and very readable. Your examples are really well done and they come to life in different ways. My favorites so far are Leila and, of course, Sree! What I like best about the approach is that, while recognizing the financial side of "personal success", you consistently make it clear "between the lines" that career success is about a lot more than just the money." Jon Katzenbach best-selling author of Teams at the Top, Wisdom of Teams, etc. Roopa Unnikrishnan has almost two decades of experience in roles where she has seeded and driven change and innovation in several Fortune 500 companies. Roopa works with Consumer Goods, Education and Technology clients, helping them establish and improve key processes around strategic planning, innovation space identification and idea development. A master coach, she works with senior executives to drive personal and career change. Roopa was previously at Pfizer as VP, Corporate Strategy and Global Head of Pfizer’s worldwide talent and organizational team for Sales (2007-2012), at BlackRock as HR lead for sales and Citicards as Strategy Director. A Rhodes scholar with an MPhil and an M.B.A. from the University of Oxford, is also a published poet and a world-class athlete in sports riflery. 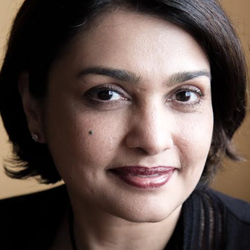 She is currently President of TiE’s NY chapter, a group focused on fostering entrepreneurship, and was previously Board Chair of Sakhi which works to end domestic violence.